President Donald Trump celebrated the one-year anniversary of his election victory, sharing a message on Twitter. “Congratulations to all of the ”DEPLORABLES” and the millions of people who gave us a MASSIVE (304-227) Electoral College landslide victory!” he wrote, sharing a picture of the president with senior advisor Jared Kushner, Stephen Miller, Hope Hicks, and social media director Dan Scavino. Everyone flashed a “thumbs up” signal as they stood around the president in his office aboard Air Force One. Other members of the Trump family recalled election day on social media. I always thought this was pretty cool. It used to hang in the campaign headquarters. A little #maga nostalgia on the eve of MAGA Day??? Donald Trump Jr. shared a photo of a “Deplorables” banner that once hung in the campaign headquarters. November 8, 10:52am: In the car on the way to cast our vote for Grandpa! ; November 8, 8:44pm: Watching the election results roll in; November 9, 1:26am: @realdonaldtrump, Jared, Stephen Miller and I working on the victory speech; November 9, 2:52am: Victory! It’s been an incredible year. I’m as proud of my father’s commitment to and passion for our great country today as I was exactly a year ago! #MAGA #USA #Nov8 ?? Ivanka Trump shared a timeline of election day as well as a photo of her daughter with her grandfather on the day. 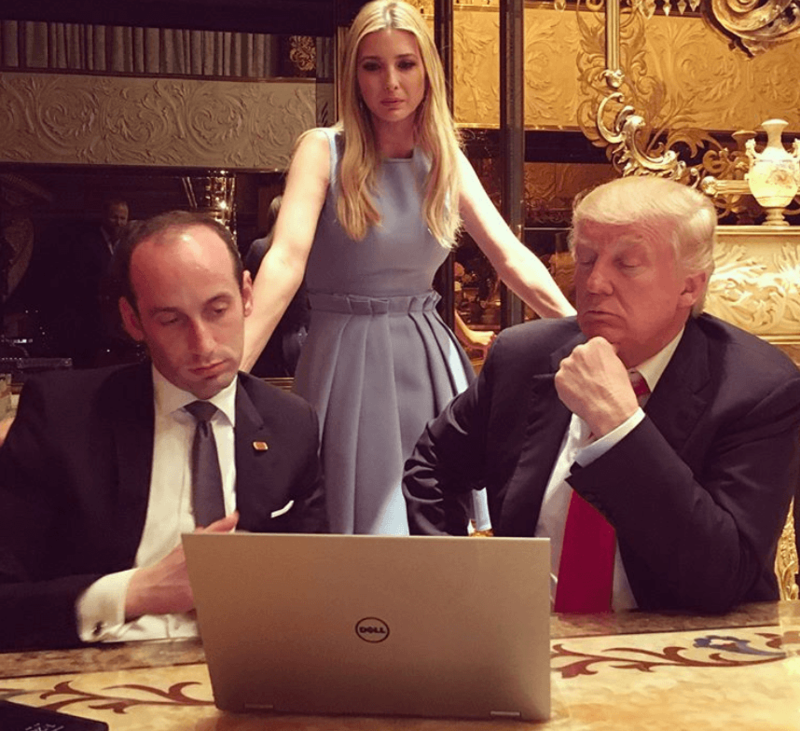 “1:26am: Donald Trump, Jared, Stephen Miller and I working on the victory speech,” read the caption. Ivanka also shared photos her helping Trump work on his victory speech that night. “It’s been an incredible year. I’m as proud of my father’s commitment to and passion for our great country today as I was exactly a year ago!” Ivanka wrote.